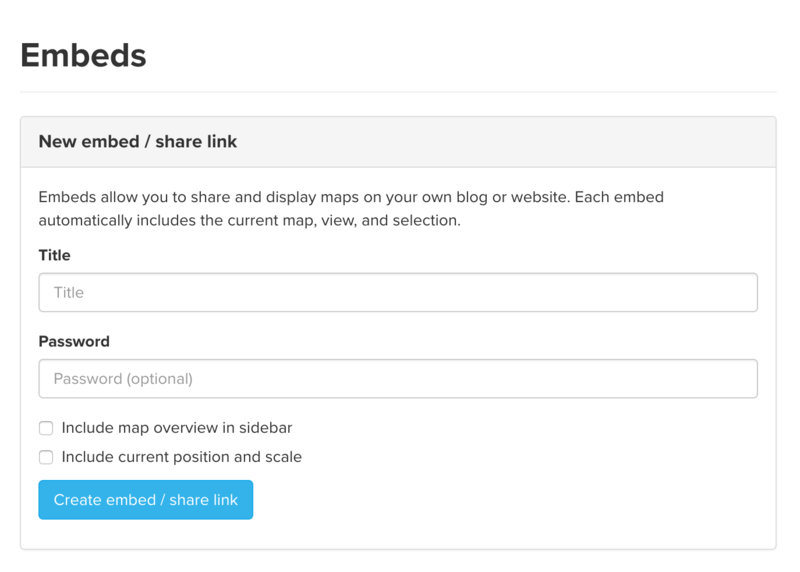 Include map overview in sidebar allows you to include the sidebar in your shared/embedded map. If you don&apos;t select this option, the map will be displayed full screen. When your readers start to interact with the map, the sidebar will follow the standard behavior—when an element, connection, or loop is clicked, the profile will expand. Include current position and scale allows you to override the default "zoom fit" positioning of the map and instead use a custom position and zoom level. When you&apos;re done adjusting the settings, click "Create embed / share link". Then, just copy the share link and send it to a friend, or copy and paste the iframe code into your website to embed. You can also use the external link button () to open the map link in a new tab. Anyone who has access to the the share link or the embedded version will be able to view the map, even if the project is private. Shared/embedded maps won&apos;t reflect updates you have made to the content of the map (elements, profiles, connections, etc.). To reflect content updates, you need to create a new share/embed link. The only exception is for maps importing data from remote source, like Google Sheets or a JSON blueprint. Changes made to the content in the remote source will appear on the embedded map within one hour. Shared/embedded maps doreflect changes to the view, which means that you can&apos;t save focus settings to an embed. To embed focus settings, you can first create the embed, then visit the embed and apply your focus settings. Your focus settings will be added to the URL as parameters—for example, my-element?focus=2. Copy the new, full URL, and you can share or embed that link to let your readers view your focus settings. To use them, just add the desired parameters to the query string of the embed URL. Note that you need to put a ? after the default URL before adding custom parameters. To avoid interfering with page scrolling, scroll-to-zoom is disabled when embeds are served within iframe elements. You can use the scroll=1 parameter if you would like to restore scroll-to-zoom behavior. In Kumu, you can create presentations to walk your readers through a map, step-by-step. You can also embed presentations on other websites—check out the presentations guide.